The Yorkshire mill provided the rich scarlet woollen cloth used to dress the original ‘red coat’ soldiers in 1815. The cloth is still made today in exactly the same way at the 232 year old mill – and will be worn by ‘soldiers’ taking part in this year’s historic re-enactment. Tom Hainsworth, MD of Hainsworth, said: “In 1815, our mill manufactured the iconic scarlet fabric for the English forces at the Battle of Waterloo, helping to coin the enduring reference to the battle of ‘the thin red line’. “The mill would have been phenomenally busy at the time of Waterloo – war always stimulates the textile trade. We have continued to play a role in subsequent wars including both World Wars and were commissioned by the British Military to develop khaki to better fit modern warfare. 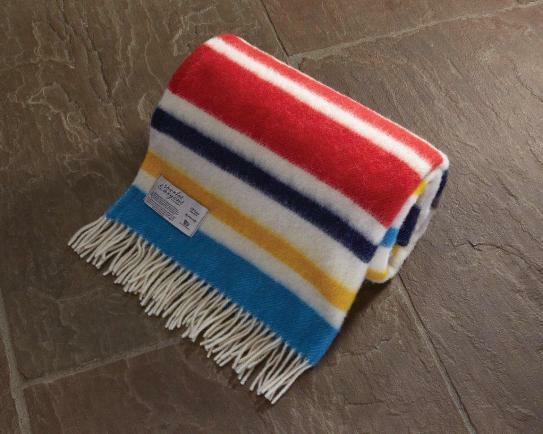 The throw is woven in the colours of the uniforms Hainsworth supplied to the troops and is made from 100 per cent Pure New Wool. It costs £110.